The naked-eye characters of a leaf may be seen in that of a Vine. The leaf is three- to five-lobed, with as many primary veins running from the base to the tip of each lobe. Smaller veins pass through the leaf in a variety of directions, the smaller ones forming a kind of netting. The veins are fibro-vascular tissue that come from the stem, pass through the leaf stalk, and divide into three or five main branches at the base of the blade. The spaces between the veins are occupied by thin - walled cells of various forms according to their function. 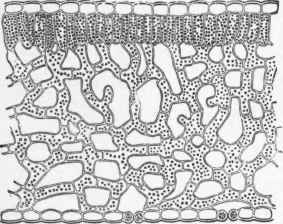 A section through a part of this kind of tissue in Franciscea (or Brunfelsia) is shown in fig. 29. The layer of empty cells on the upper side is the skin or epidermis, the cells of which are filled with water in the live state. The outer walls on the exposed surface are more or less thickened, the thickening being termed the cuticle. In leathery leaves, like those of a Camellia, Palm, Laurel-cherry, or Rhododendron, the cuticle is considerably thickened to keep out water and to prevent the loss of it from within. In many leaves the interior (fig. 31) of the wall is greatly thickened to impart strength and protection to the softer tissues. Below the skin are palisade cells, placed at right angles to the surface and one, two, or more layers deep. These are filled with protoplasm, chlorophyll, starch, sugar, and sometimes other substances. Between the palisade cells and lower epidermis lies a mass of spongy tissue not always so open as in this particular leaf, but filled more or less with similar materials to the palisade cells. The lower skin shows two air pores or stomata cut through and leading into breathing or respiratory cavities. The latter are continuous with others leading all through the leaf. The air pores of land plants are most often situated on the lower surface of the leaf, but may be equally numerous on both sides of the leaves of Iris, Carnation, and others equally exposed to light on both surfaces. The internal structure in these cases is alike on both sides. The leaves of Water Lilies and others which float on water have the air pores on the upper surface; while leaves developed under water have neither cuticle nor air pores. The tissue of a Mushroom contains neither chlorophyll nor starch. Fig. 29. 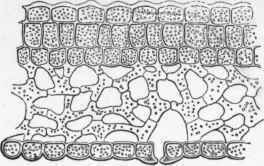 - Vertical section through Leaf of Francitscea eximia, showing Epidermal, Palisade, and Spong Tissue, and two stomata cut through. Fig. 30. - Vertical section through a Leaf, showing Epidermis, Palisade, Spongy Tissue, and a Stoma cut through. Fig. 31. - 1, Shows Epiderm with thickened upper wall and palisade cells beneath, filled with chlorophyll. 2, Epidermal Cells thickened on one side, with Cellular Tissue beneath. Fig. 32. 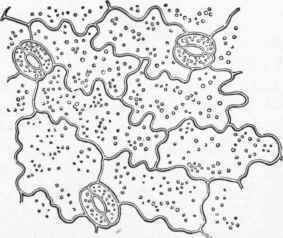 - Stomata. Surface view of a portion of the Frond of a Fern, Nephrodium Filix-mas.